Haig, Matt. 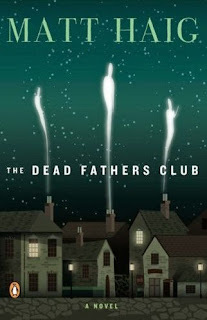 The Dead Fathers Club. New York: Penguin, 2006. I finished reading this a little to late for it to form part of the discussion of modern versions of Hamlet in my Modern Shakespearean Fiction class, but it may make its way into future versions of the course—as an option, I think, rather than as a course text for everyone. The protagonist, Philip, is eleven years old—which is on the young side for derivative versions of the Danish Prince—and that might lead some readers to think that this is young adult fiction. Partly because of the extent and kind of profanity in the book, I would not classify it as such. The novel also grapples intriguingly with issues and ideas of a more advanced kind—though all in the voice of an eleven-year-old boy. Perhaps it's because I'm currently re-reading The Sound and the Fury, but I was impressed by the creation of a voice that can relate everything it sees but lacks the maturity necessary to comprehend or to interpret it. There are some very intriguing alterations to the plot, but I really can't go into them without causing major spoilers. With an appropriate qualification about the obscenities in mind, The Dead Fathers Club provides an interesting take on Hamlet—one that invites us to return to the play for yet another reading.